AMP Ready Blogger Template is a term for a Blogger template that uses AMP HTML language, and can be applied to a Blogger / Blogspot Blog. This template became popular since the development of AMP HTML, and began to be used a lot in the past 2016. In the past 2 years, there have not been many Webmasters who have created AMP HTML-based Blogger Templates. Maybe at this time there haven't been 50 Blogger AMP HTML Templates. If there are any, not all are free, only a few offer free. This is very reasonable, because making an AMP-based Blogger template requires special handling and understanding of the relatively new AMP HTML language. If you are interested in "upgrading" to AMP HTML, I would recommend 5 AMP HTML based Premium Blogger Templates below. Kompi Ajaib AMP is an AMP Ready Blogger Template by Adhy Suryadi, owner of KompiAjaib.com. This AMP template has been widely used by Bloggers, both AMP and non-AMP template. This template has a Grid style on HomePage, Full Width, and very quickly accessed. This premium template is valued at USD15, complete with Theme Documentation. VioMagz AMP is an Premium Template based AMP HTML by Sugeng.ID (Indonesia Blogger). This template has a unique style, and is very quickly accessed. Not only in the AMP version, Sugeng.ID also offer non-AMP versions of this template. With only USD 15, you can get 2 templates at once. 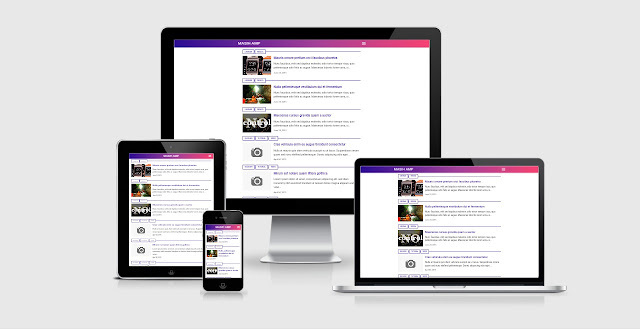 Purple AMP is AMP ready Blogger Template by Goomsite, one of the biggest template sales sites. This Magazine style template is perfect for those of you who have a news blog. Goomsite sets a price of USD 9, complete with Theme Documentation. Still with the work of Goomsite, this time it's called Goomsite AMP. The Goomsite AMP template itself is valued at USD 13, you have an official license and Theme Doucmentation. This template matches you apply to the niche Technology Blog, and Tutorial. Travelord AMP is Google AMP Ready template for Blogger / Blogspot. Travelord AMP developed by Hafid Maulana (www.amp-blogger.com) and released for public at November 2018. Travelord AMP is inspired by a dynamic, elegant and simple design, in accordance with the current internet phenomenon. Template is perfect for those of you who have Travel Blogs, Short Stories, Gadgets Info, Reviews. With only USD 5.99, you can get this SEO AMP Blogger Template, and get Alinux AMP Blogger Template during the promotion period.